The Stowell Park Estate is a private agricultural and sporting estate in the heart of the Cotswold Hills close to Northleach and to the west of the Fosse Way where it joins the A40(T). The Estate has been owned by the Vestey family since 1921. It extends over 5,500 acres of grassland, arable and woodland on both banks of the river Coln. There are very good inter-connecting public rights of way. The principal village is Yanworth. 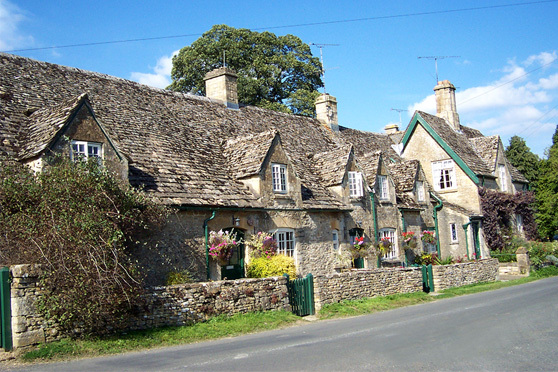 This is a charming, quiet and unspoilt Cotswolds village with a wealth of traditional stone houses and barns. In Yanworth and elsewhere on the Estate we have a number of houses for letting ranging from small semi-detached cottages to substantial houses and also traditional and modern farm buildings converted for commercial use, including offices, workshops and storage. Northleach (2 miles) is a pretty, old wool town with a range of shops including a supermarket, a bakery, a chemist and an outstanding butcher. There is also a quality wine merchant and a number of good pubs and restaurants. Communications are excellent: Cirencester 8 miles; Cheltenham 15 miles; Oxford 30 miles; and London 90 miles. Fast train services to London from Swindon, Kemble and Kingham. emergencies. Rents are competitive and we welcome long lets. You probably were not expecting to find it on this website, but we also have a beautifully modernised farmhouse on the idyllic Hebridean Isle of Jura for holiday lets. Find out more by visiting www.sawdays.co.uk/britain/scotland/argyll-bute/feolin-farm.